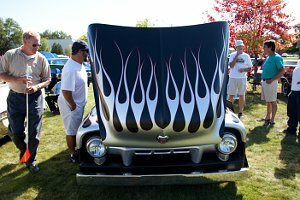 TRAVERSE CITY, MI — See cool cars and support students at NMC’s 10th annual Mike McIntosh Memorial Truck and Car Show. Saturday, September 12, 2015 car enthusiasts will display their classic cars, 4X4s, dragsters, sports cars, modified late models, motorcycles and more. The show, from 11 a.m.–3 p.m., will be held at NMC’s Automotive Services Building at 2510 Aero Park Drive. Admission is free for spectators. There is a $10 entry fee per vehicle for contestants. Registration begins at 8 a.m. Trophies are awarded for best of show in each class. Enjoy food, music, a silent auction — including program vehicles — and door prizes for entrants. Proceeds benefit NMC’s Automotive Program and scholarships. Student projects and vehicles will also be on display. This year students will continue the tradition of restoring and donating vehicles to the Goodwill Workers on Wheels Program. Students will also tackle the fun challenge of restoring a 1963 Ford Galaxie called the “Barney Ride.” The vintage police cruiser, like the one featured in “The Andy Griffith Show,” comes complete with radio and lights. The show is named for the late NMC Automotive instructor Mike McIntosh, who retired in 2004 after 34 years of service. McIntosh organized the first car show for the Automotive Program in 2004.